Panthertown is a sanctuary for American black bears. Panthertown is part of a protected bear sanctuary. Visitors to Panthertown should be aware that black bears (Ursus americanus) live here and are protected here. This is their natural, wild habitat. Panthertown and the surrounding forests are their territory. This is their home. Panthertown is designated by the North Carolina Wildlife Resource Commission as part of the Panthertown-Bonas Defeat Bear Sanctuary. Bear hunting is prohibited year-round anywhere within Panthertown or Bonas Defeat. Bears are currently active in Panthertown. Always be bear aware when visiting. Due to increased bear activity in Panthertown and the surrounding National Forests of North Carolina, U.S. Forest Service strongly recommends all backcountry campers use bear resistant canisters and carry a readily available can of bear pepper spray (rated as bear spray by the U.S. EPA). Always follow manufacturer recommendations. 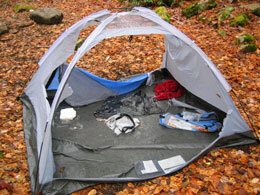 Never store food or scented items in your tent, including toothpaste, deodorant, beverages, or snacks. Securely store food and scented items in bear-proof canisters. Clean up food and garbage around fire rings and around your campsite. Do not leave food or coolers unattended. Never run away from a bear – back away slowly and make lots of noise. If a bear approaches, move away slowly; do not run. 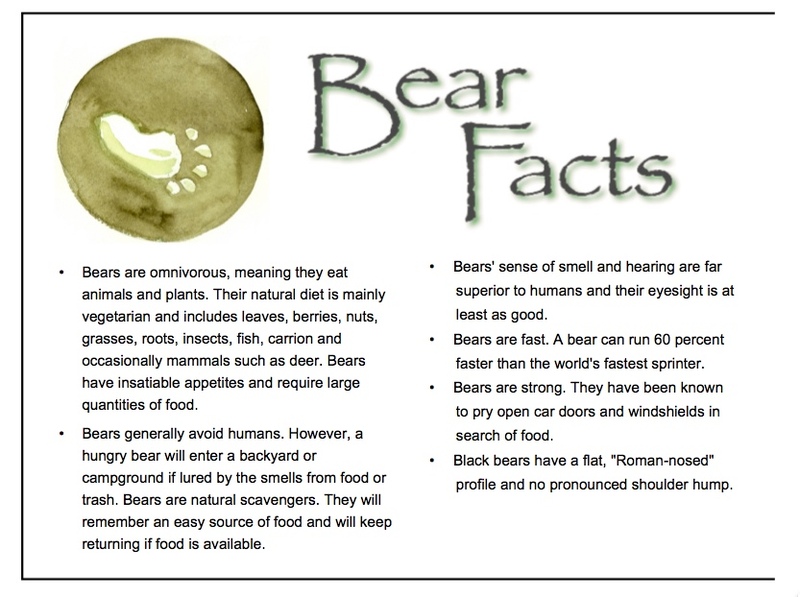 According to U.S. Forest Service, black bears in the wild are opportunistic, feeding on whatever is readily available. Food odors and improperly stored garbage will attract bears to campsites and picnic areas, even when humans are around. Though bears are naturally afraid of humans, bears habituated to human food can begin to associate human scents with the reward of food. Due to this, bears can become a threat to humans, property, and themselves. Remember, a fed bear is a dead bear. Protect the bears. Don’t feed the bears. Don’t give this bear a reason to visit your tent! When visiting a national forest in North Carolina, including Panthertown and Bonas Defeat, seeing a black bear can be a thrill. But, if the black bear rips through your tent for a granola bar, a bag of chips or a tube of toothpaste, a carefree camping trip can turn deadly. Experts estimate the average weight of a black bear is around 300 pounds. Despite their size, black bears are very agile tree climbers. During times of danger or threat, bear cubs will take shelter in trees. Bears by nature are opportunists. In the wild, they will feed on whatever is readily available. 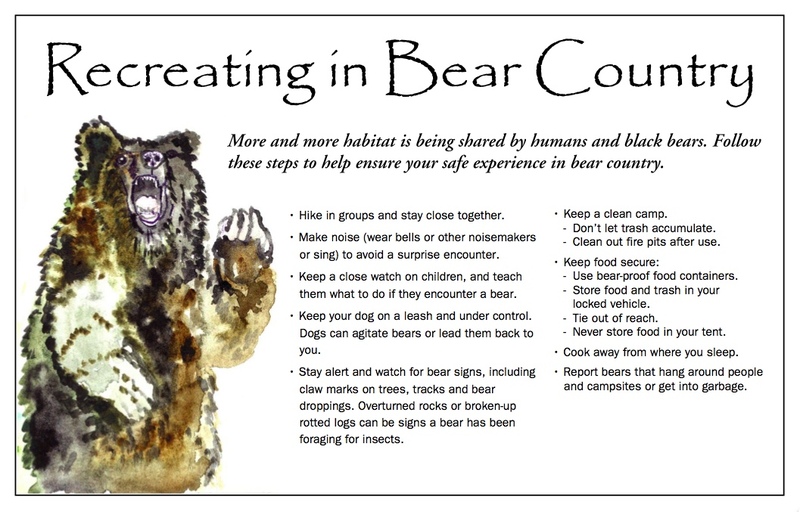 Food odors and improperly stored garbage will attract bears to campgrounds and picnic sites. Bears become habituated to human food if they find it readily available. Although they are naturally afraid of humans, the animals lose this fear as they begin to associate human scents with the reward of food. Black bears can become a threat to humans, property and themselves—a pattern that normally ends with death. 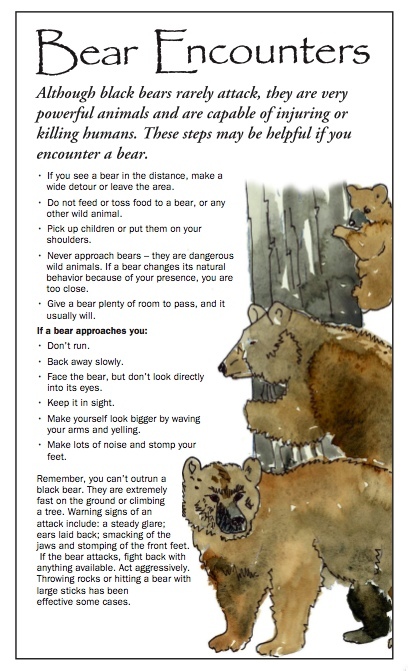 Protect yourself and protect the black bears by following these safety guidelines. Get into a vehicle or a secure building. If you are attacked by a black bear, try to fight back using any object available. Act aggressively and intimidate the bear by yelling and waving your arms. Playing dead is not appropriate. 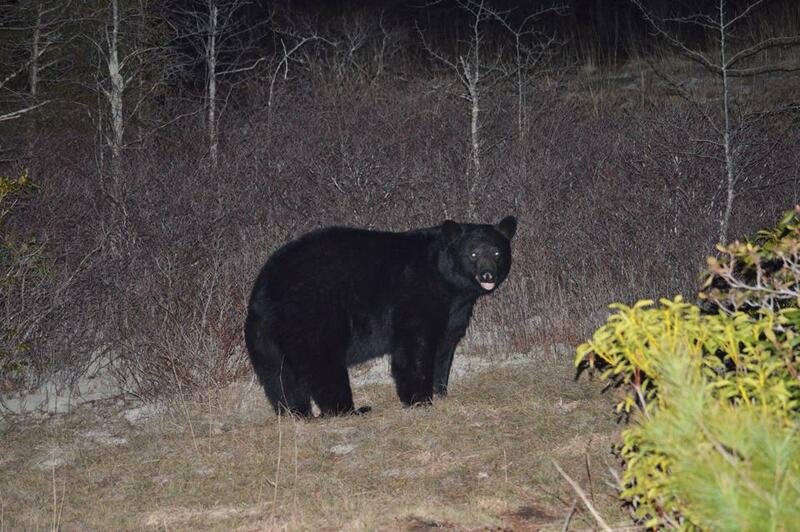 While black bears can be tolerant of people, they should always be treated as the wild animals they are, whether in a residential or backcountry area. Black bears are rarely aggressive towards people and typically go out of their way to avoid contact. However, as more campers and visitors arrive in Panthertown and bear numbers increase, interactions will be unavoidable. For bears, Panthertown is a safe place to live, roam, and look for food. This is their home. Humans are the guests here. Food smells attract bears to your tent! Black bears are very curious animals and this should not be confused with aggression. If a bear approaches you in the wild, it is likely only trying to assess your presence. Bears will often stand upright to obtain a better sense of smell. If you see a bear from a distance, alter your route of travel. When camping, keep all food stored properly and away from tents. Not the kind of visitor you want in your camp. Slowly back away while facing the bear at all times. Running from a bear will often trigger its natural instinct to chase. If approached by a bear – stand your ground, raise your arms to appear larger, and yell until it leaves the area. Shouting and making noise may help. If a black bear attacks, fight back aggressively and do not play dead! If cornered or threatened, bears may slap the ground, “pop” their jaws, or “huff” as a warning. If you see those behaviors you are too close! 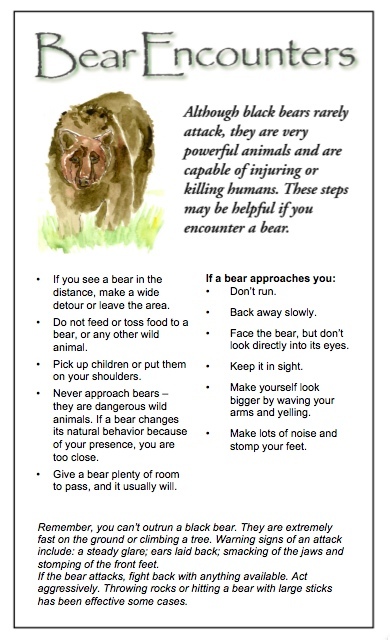 We recommend you review these Bear Smart tips on what to do if you encounter a black bear in Panthertown. If camping, we also recommend tips on securing food and garbage. Be bear aware in Panthertown! If you enjoy hiking in Panthertown Valley and would like to protect this special place, we ask that you become a supporting member of our organization by volunteering at one of our upcoming trail work days, or by becoming a member. Donations are tax-deductible and new volunteers and members are always welcome to join us. Saw a black bear at the big campsites near the sandy beach area (forget the names of things now). He circled around our campsite as well as our neighbors for more than 90 minutes. We would bang pans and yell at it, it would disappear and then circle around and approach from another direction. It would not leave, was habituated to humans, and seemingly just waiting for us to go to sleep so it could raid our camp (we hung bear bags very far away). We decided to pack up camp and leave in the middle of the night after he would not leave. People should not be camping in panthertown right now, even with bear cannisters. They are too habituated and will definitely invade your camp even if you take proper bear precautions. OK, this was April 12, 2017. Has anyone else encountered a bear situation lately (Oct. 19, 2017) in Panthertown area? We were planning a backpacking trip to this area; we have bear boxes & bear spray, however, after reading this we may reconsider our trip. Reconsider. This area needs a break from humans unless you like sleeping with bears. Wow, though it has been awhile since I backpacked around PT and camped, I never had problems with bears. In fact, camping all over Nantahala and Pisgah, I never had problems with them. I wonder if people are just taking to much odorous food into the backcountry. I only took MRE’s for lunch/dinner, powdered instant coffee and instant oatmeal for breakfast…. (The MRE’s had the water activated heater) Used a white fuel stove to boil the water for breakfast. And burned all refuse pretty shortly after consumption. This way everything is sealed until consumption. No lingering odors around the site. I know it’s not an exciting menu but, I’m there for the scenery, getting away, etc…..Not backyard BBQ, or the triple D.
But then again, seems there are more known trails in PT these days, and probably a lot more peep traffic. Dang, me and some buddies really want to do a backpacking trip through PT in the coming weeks, but this sounds a little intimidating. I hear these bear incidences are occurring mostly at the shelter, near the sandy beach area, and near schoolhouse falls. Do you all think it would be alright to camp in the area between riding ford falls and jawbone falls? I have bear canisters and would always be with my stuff. USFS strongly recommends all overnight campers use scent-proof bear canisters for food storage when visiting Panthertown Valley. Bears are currently active throughout Panthertown and have recently stolen food from people camped near the shelter and on Little Green Mountain. Canisters are the way to go. Please be bear aware, use caution, and camp at your own risk. Thank you. My husband and I experienced a bear encounter on Friday evening 6/29/18. We set up camp at one of the sites near the shelter and immediately hung our bag of food and all scented items. We did a double hang from 2 trees so it would be more difficult should a bear try to steal it. We left camp long enough to walk down to the creek to fill our water bottles when we heard a loud cracking sound. Sure enough, when we turned the corner back to the campsite, there was a bear in the tree trying to steal our bag. We managed to run him off and moved the bag even further away from camp down the trail. Within another 45 minutes, he was back again trying to get the bag down. We were shouting at him and I was blowing my whistle, and it still took us a good 5 minutes to scare him off this time. At no point did we feel threatened by him, and he was not being aggressive, but he clearly had no fear of humans and would’ve been there all night until he successfully had the bag out of the tree. We decided to pack out instead of staying the night, and after reading reports of other encounters here once we got out about bears damaging tents and other items even with no food stored in them, we feel we made the right choice in leaving. I don’t think even a hard sided canister would’ve deterred him for long. This bear has clearly had many successful attempts at stealing food. We videoed our encounter from a safe distance and turned it into the ranger station Monday morning. We love bears and have camped in bear country many times, both in the Pisgah and in the Colorado backcountry, and have never had any issues like this. I hate to say that this area should probably be closed to overnight camping for awhile, like up at Graveyard Fields, but these bears need time away from human interaction. For people who plan on camping in Panthertown, I would definitely recommend taking everything on this website VERY seriously. The bears here have little fear of people and they know where to look for campers’ food. My boyfriend and I recently camped near the A-Frame – I have camped in Panthertown at least a dozen times (I’m from the area) but had never had a problem with bears until this trip. We also didn’t think to check the website before heading out. If we had I think we would have been even more careful with our food. We put all of our food & scented items in a bear bag and hung it 15 feet up, at least 12 feet out from the tree trunk & 7 feet below the branch it was hung from. We were also careful not to leave food remnants around the area. Despite our efforts 2 different bears managed to get into our bear bag during the night. The first bear was very small but had no problem getting to it around 11pm. The second bear was quite a bit bigger and when we tried to protect our supplies and scare it off it charged at me. We were planning on camping for 5 days so really wanted to keep our food supply intact. Thankfully screaming and banging things together made it change its mind and turn around. We ended up leaving after this last encounter, which was around 6am. Panthertown is a truly beautiful, unique place, but I agree with another commenter that it may need a break from humans. These bears are much too comfortable around people and it would be a tragedy both for the humans and the bears if anyone ended up getting injured. Went for a three day backpacking trek earlier this week with my cousin and bears were definitely active. Camped first night at the Sand Bar Pool and hung food cautiously – never saw the bear but thirty minutes after dark the bag was torn into and we were able to salvage our MREs – animal was spooked and did not return. Second day looped to Granny Burrell Falls and while sun bathing/swimming a rather large bear crossed the sandy beach at bottom of the pools – was spooked by dogs barking further up the trail when attempting to cross back over. That night we stayed at the A-frame shelter with another pair of people (a very welcomed sight) a small bear fumbled with the bear proof container placed away from the shelter before dark; backed off with a whistle – our bag was devoured again after hanging 20 + feet in the air. Bear continued to come to shelter the next morning 3 or 4 times.. despite screaming/whistle and two dogs barking. This is an EXTREMELY beautiful section of our National Forest System – will be back again – with bear proof container!! Thank you for your bear report. We will forward your comments to USFS and NCWRC. We agree with your decision to bring bear proof containers on your next visit. They are strongly recommended by USFS for storing food and scented items when camping in Panthertown. 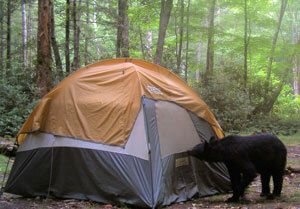 We encourage everyone to be bear aware when visiting Panthertown, especially when overnight camping. Black bears live here. This sanctuary is their home. Just wondering if day hikers have had problems with bears. I would think you would need bear spray, but a canister? I can’t imagine Yogi snatching my peanut butter sandwich out of my hand, but overstuffed always a first time. We recommend everyone who visits practice Leave No Trace, be bear aware, and follow the advice of the U.S. Forest Service. Bear sightings while day hiking are rare. Visitors should use appropriate caution in Panthertown when carrying, storing, and cleaning up food, trash, and scented items, especially when camping overnight. Had a black bear encounter on Sept 1st and Sept 2nd, 2018 around Pittillo’s Pool. Clearly he makes the rounds at the various campsites each night and knows humans well. He came around dinner time when things were not properly packed, stored and cleaned. Although we had most things in the bear can, I wish we had the bear spray to have time to pick up trash etc, and knew to make lots of noise. He was interested in my toothpaste and mouth wash in my tent but luckily didn’t damage it – he just flattened it during his inspection. Completely agree now, don’t keep anything in your tent that smells. Thank you for sharing. We will pass your report on to the U.S. Forest Service and North Carolina Wildlife Resources Commission. Any updates on recent bear activity in Panthertown Valley? It is Oct. 21 and I am planning on spending 2 nights in the area next weekend? The bears are still very active in Panthertown. Proper food storage is essential. U.S. Forest Service strongly recommends all backcountry campers use bear resistant canisters and carry a readily available can of bear pepper spray. A black bear entered our campsite around 7:30 pm on October 20th. It left the campsite pretty quick but returned about an hour later. We hung our food about 9 feet high, but the bear was still able to get it and eat every single thing we had. Nothing was left. It even licked our peanut butter clean. About an hour after hearing it get our food, I got out of my hammock only to find it sitting about 15 yards way from from me. I stood still and watched it as it walked over to our packs. Thankfully, it only sniffed around our packs and didn’t take anything. It finally left the campsite around 11 or so. Next time I will definitely bring a bear canister instead of just hanging the food. These bears are everywhere. One came into our campsite last time I went too. Thank you for sharing your report, Wilson. We are glad to hear nobody was hurt when the bear raided your campsite. Storing food and scented items in a bear resistant canister is strongly recommended by the U.S. Forest Service. We agree with your decision to bring one next time. Thanks for the very recent update on bear activity in Panthertown. It sounds like they are getting as smart as Yosemite bears if they can figure out how to grab food bags about 9 feet off the ground. It definitely sounds like a bear canister is in order. I really do not like the idea of bear spray because conditions must be just right for it to be effective. Took a group of young boys (10 boys, 5 adults) in the West Side of Panthertown Valley this past weekend (4/12/19). We reached the A-Frame shelter around 8:15pm. We were not aware of the recommendation of bear resistant containers but did have bags holding all of our food. We encountered a rather large bear about 45 minutes after arriving just feet from the shelter. He was estimated to be between 300-400 pounds. We were on our way to hang our food bags. He ran quickly and we hoped/expected to not see him again. We then hung those bags about 75 yards from the shelter at a height of about 15 feet off the ground, 5 feet below the limb and about 10 feet from the tree trunk. Before we finished, the bear had already returned to the shelter and entered a backpack. As soon as we found the packs had been entered, we heard a commotion near our food bags. Apparently this VERY intelligent bear was swiping at the ropes holding our food bags and managed to rip one, allowing it to fall to the ground. He took the bag into the woods. At that point, we felt this bear was going to persistently hang around, possibly becoming more aggressive – so we left immediately. We regret leaving the bag but weren’t sure where to find it and we were not comfortable looking for it in the dark. We will not be returning without bear resistant containers but do look forward to returning. No injuries – including the bear. May he live long and prosper. Thank you for sharing your report. We are happy to hear there were no injuries. We have passed the information to the U.S. Forest Service. I went camping in panthertown, and despite taking proper precautions by hanging the food from a branch at least 15 feet high that was about 200 yards from the campsite, a bear was still able to access our food. The same thing happened to the group about a quarter-mile down the trail, and they had their food suspended between two trees. I believe that a bear has figured out how to get the food EVEN WHEN PROPER PRECAUTIONS ARE TAKEN. We make sure to bring a canister next time, and you should as well. P.S. We were camping at the shelter at the bas of the great wall. Also, we saw the bear in camp just before sunset. Thanks for letting us know. We have shared your report with the U.S. Forest Service and agree that bear resistant canisters should be used.